Earlier in the year Birdwing agreed to provide funding for the new, vitally important, pelican breeding platform at Lake Kerkini. In December, when the water levels were low enough to begin its construction, staff from the Management Body of the National Park of Kerkini began the work. The previous platform had deteriorated over the years as the wood rotted due to it standing in water much of the year and a brand new platform costing thousands of euros was required. Given the many generous donations to Birdwing we were able to provide the necessary funding and it has been a delight to see its construction. During November and December work on the new pelican breeding platform took place, as the photos here show. 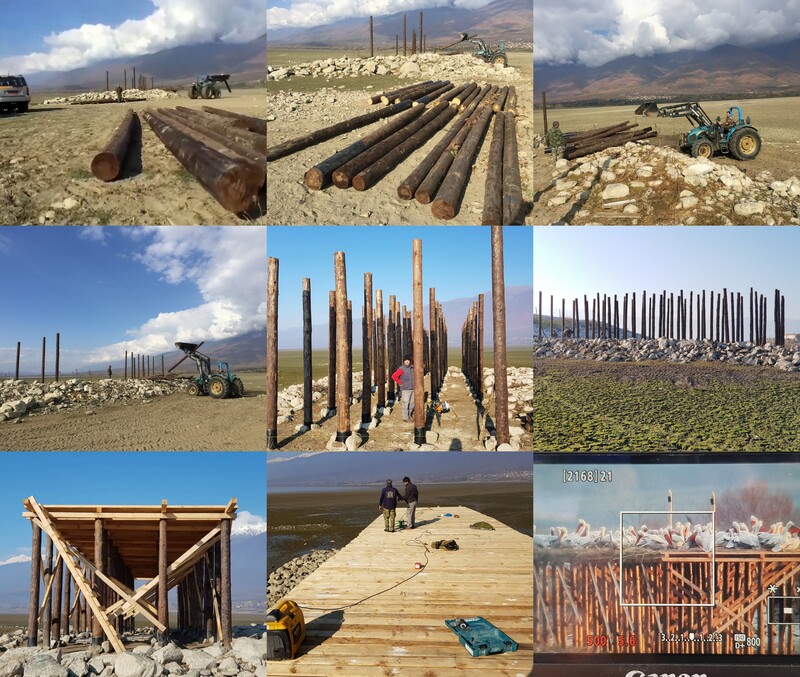 Staff from the Management Body of the National Park of Lake Kerkini undertook the work to create the larger platform with a nesting area of over 100 m2. In early February as the last of the reeds were placed on it Dalmatian Pelicans were already adopting it as the final photo below shows. This excellent action could only happen thanks to the generous donations to Birdwing from many people and organisations, including Greenwings Wildlife Holidays (www.greenwings.co), DUMA (www.duma-naturreisen.de), Meriel Wilmot-Wright, Deborah Whitehouse, Josef and Alex Wirth, Stefan Schlik and others and we wish to thank everyone who has supported us to be able to fund important work like this. Plans for a second platform for the growing number of pelicans, including White Pelicans that have started to breed in recent years, are being discussed for next season together with another raft for breeding terns. Frozen and then wet Greece! During early January an extremely cold weather system hit Greece, resulting in snow and ice across large parts of the country. During the winters of 2016/7 and 2017/18 the Lesser White-fronted Geese have spent the whole season at Lake Kerkini, but the cold snap at the start of the year resulted in the population moving to the milder Evros Delta. 112 Lesser White-fronted Geese left Kerkini at dawn on 6th Jan and by noon they had arrived at the Evros Delta, where they stayed for almost three weeks, before returning. Heavy rain across the country later in January caused some flooding across the region, falling as snow in higher places such as Prespa. The weather conditions partly delayed interest in breeding for birds such as pelicans, herons and Kestrels, but by February milder and drier weather improved conditions. For more bird news click here. We all see how small pieces of plastic end up floating around in all areas of our natural world, whether on land or in our oceans, and how these adversely affect and even kill our wildlife. Well, a new idea to help reduce the spread of non-recyclable pieces of plastic has begun to take off. Obviously our first approach should be to reduce the amount of plastic we buy or accept in the form of bags at the local market, and then to recycle when we can, but what should we do with the small pieces of soft plastic that can’t be recycled? The simple answer is that you should start making an Ecobrick. 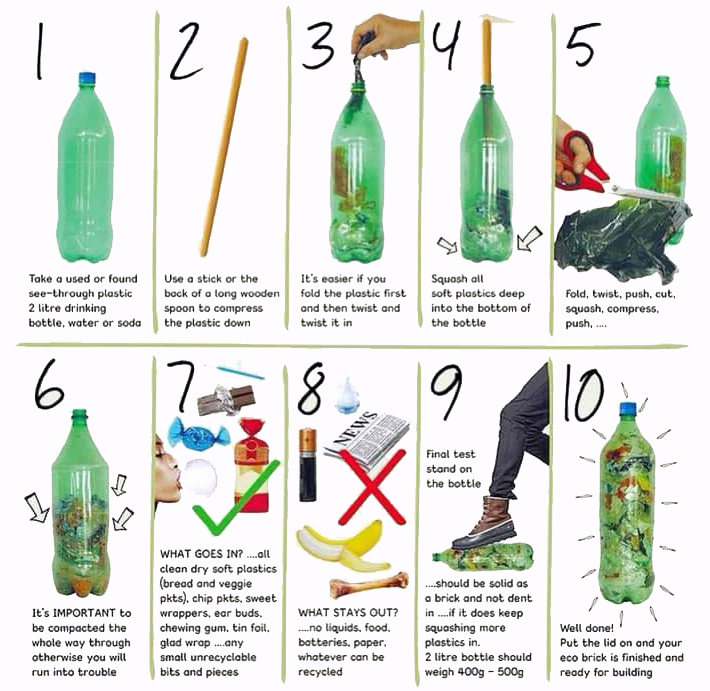 Firstly, find a discarded plastic bottle – it is hard to go anywhere and not see one – then start filling it with the small pieces of plastic. It is very important to compact the plastic as tightly as you can (weigh to check) so that the completed ecobricks can be used in a variety of ways, such as building, insulation, outdoor or play-ground furniture. 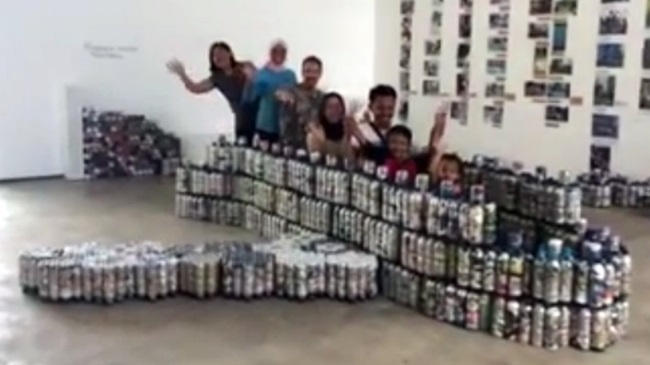 School children can be encouraged to participate and create their own constructions. Search on Google for ecobrick or see ecobricks.org, gobrik.com, facebook.com/ecobricks.org/) or suggestions of ways they can be used. Even if no charities are collecting eco-bricks near you, the containment of the pieces of plastic will reduce the amount that can damage the environment and our wildlife. 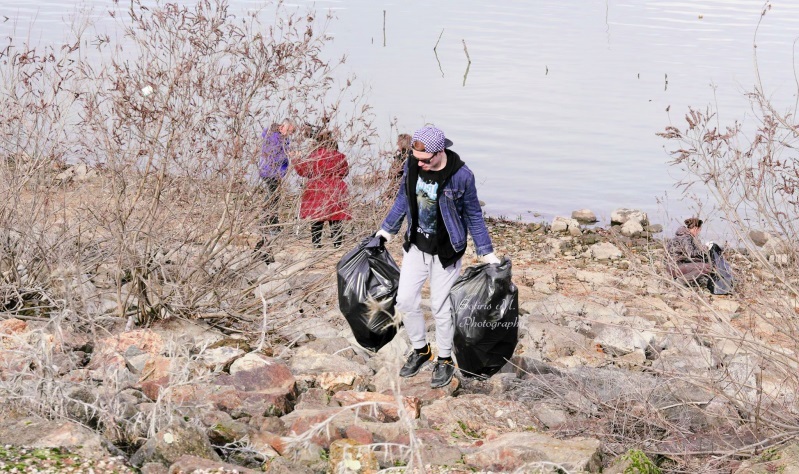 In Greece on a recent clean-up at Lake Kerkini over 50 dustbin bags full of rubbish were collected from the lakeside in the Lithotopos area as part of International Wetland Day, with the majority of the rubbish being plastic bottles. Those collecting included walkers from Thessaloniki and some international volunteers. Bottles, like these, collected in National Parks could be used for eco-bricks in the future. How sleeping has helped Birdwing! Birdwing has received a donation of €3000 from SAMINA, a German sleep-solutions company (www.samina.com/en). This came about as a result of collaboration between long-time Birdwing supporter and sleep researcher Josef Wirth and Professor Günther W. Amann-Jennson of SAMINA. Josef conducted a trial and observed and gave questionnaires to some patients before and during use of a newly developed pillow and monitored objective sleep parameters (polysomnography). The pillow can play special music in a particular manner to improve sleep. The results are soon to be reported in sleep-related journal. Rather than receiving a fee for this work Josef asked that a donation, instead, be made to Birdwing, for which we are very grateful. Josef is pictured here on the right, together with his son Alex on the left of the photo, taken on a visit to Lake Kerkini a few years ago. Are you planning to visit the Evros Delta over the coming months? If so, we’re hoping you can help us. Around the delta are many Birdwing nestboxes for Kestrels and Rollers. 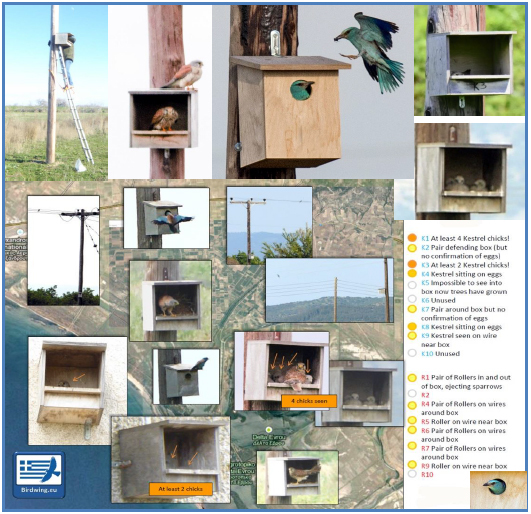 We would like visitors to send us reports of any bird activity in or around the boxes to give us a picture of the breeding interest and timings. If you are going to the delta during the spring or early summer, please email us at boxes@birdwing.eu. for the location of the boxes and further information. We wish to know the date, location and the simple code letter from this key (and number of chicks seen if appropriate) to show any bird activity in or around the nest-box. The annual autumn arrival in Greece of the entire Fennoscandian population of the endangered Lesser White-fronted Goose began early when 37 arrived at Kerkini on 22nd September. This number built to 104 on 16th October and to a maximum of 112 on 18th December. The last couple of winters have seen the flock stay at Kerkini until their departure back to their breeding grounds in March. However, as mentioned, deep snow and frozen conditions befell the area in early January, covering the feeding areas and forcing them to move on to the Evros Delta with 108 arriving there on 6th January, but this stay was short-lived, with 104 being back at Kerkini by the 26th. A record number of Common Cranes has spent much of the winter at Kerkini, with up to 70 having been counted. 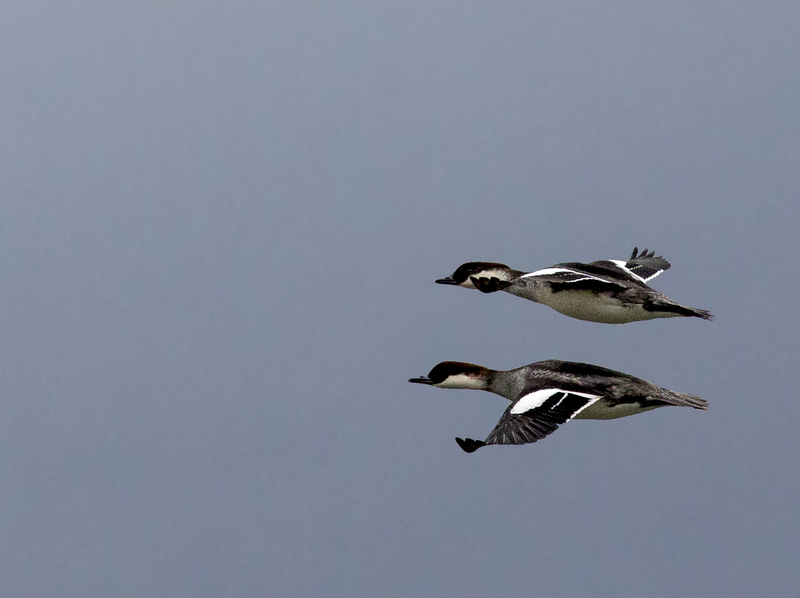 The deep snow early in 2019 in central and eastern Europe pushed many birds south into northern Greece. At the Evros Delta a national record of 5800 Ruddy Shelducks joined over 100 000 ducks on the remaining ice-free areas. Some 4150 Bewick’s, and 1500 Mute Swans joined 4100 Greater White-fronted and 150 Greylag Geese. 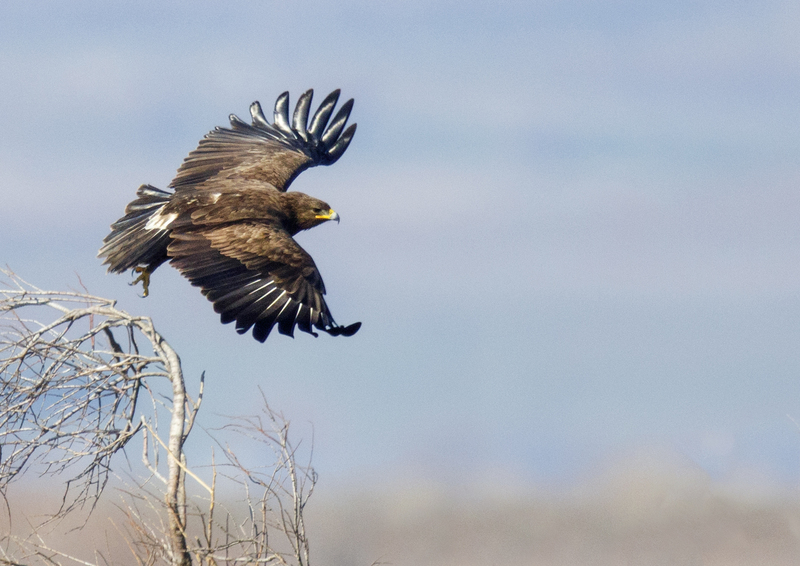 Raptors, of course, were much in attendance with 2 Imperial, 3 White-tailed and a very impressive 43 Greater Spotted Eagles, the latter figure being the highest count since 47 in 2008. 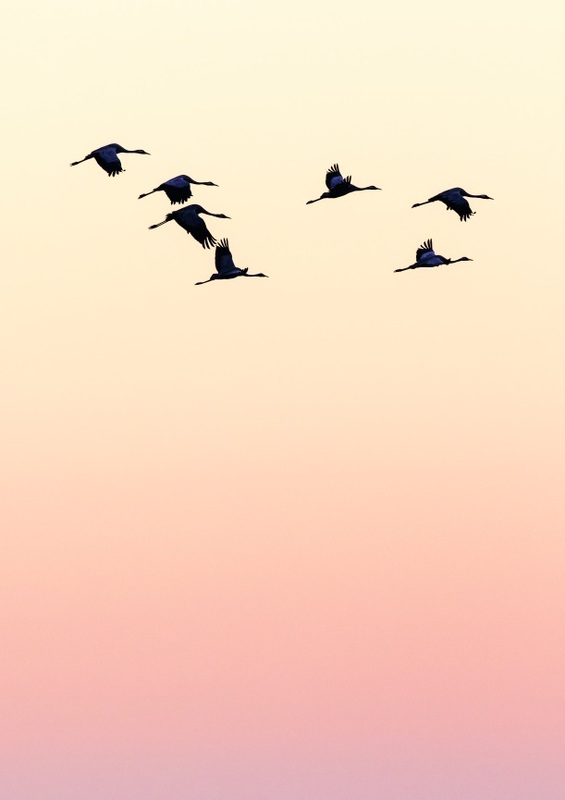 A second record fell this winter with an astonishing 8000 Greater Flamingos which spent the days feeding in the Turkish part of the wetland before returning in late afternoon to roost in the Greek part. 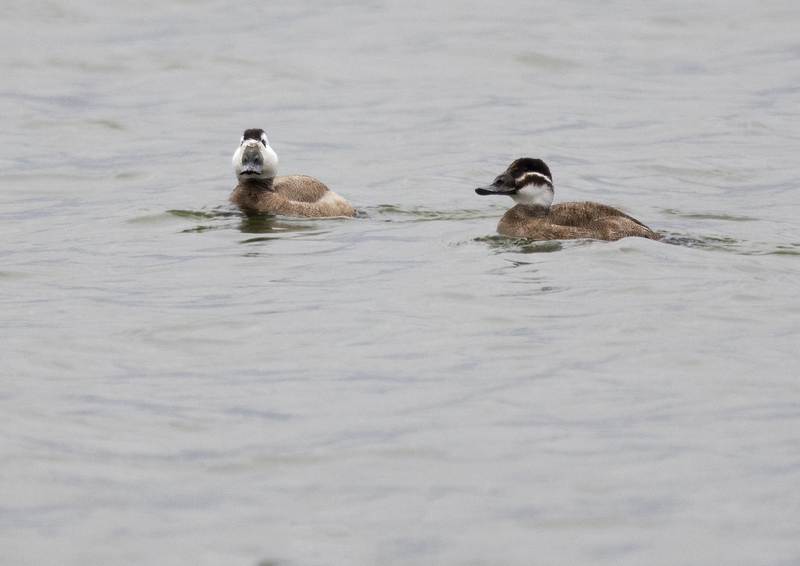 Elsewhere in northern Greece over 500 White-headed Ducks spent much of November at Lake Vistonida and an impressive 169 Smew were at Prespa in January. Also in several places, including Kerkini, Black Storks have been regularly seen during the winter months. A workshop for responding to disease outbreaks in waterbirds was held in late November in Prespa, highlighting the collaboration of Prespa National Park Management Body, the Municipality of Prespa and the Society for the Protection of Prespa (SPP). Representatives from the local veterinary authorities and Management Bodies of 8 important wetlands of the country facilitated the discussion. The workshop was part of the Prespa Waterbirds Project, to examine the "Plan for co-ordinated action" (LIFE15 NAT/GR/936). The plan forms the main tool to be used to co-ordinate local bodies and veterinary authorities in case of a disease such as avian influenza, which may affect pelicans and other waterb irds. As part of the plan two useful leaflets have been produced. 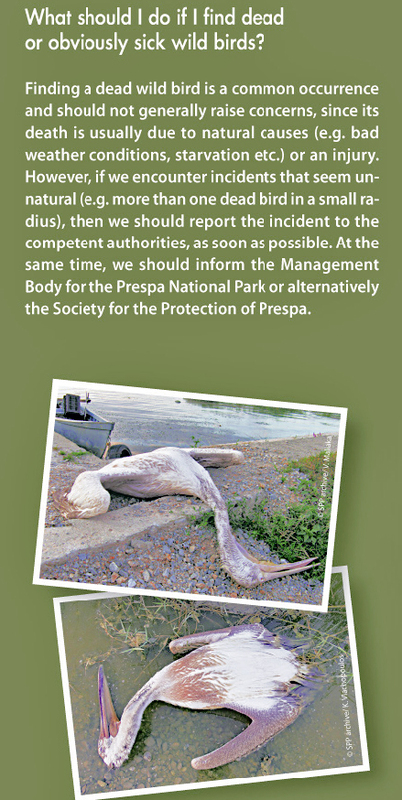 “What to do in cases of mass mortality of wild birds in Prespa" and “General Information and Answers to Frequently Asked Questions". They include practical information for birdwatchers, local people or for anyone finding sick or dead birds about how to report this. During the workshop, these and other procedures were discussed and three Management Bodies (Lakes Koronia and Volvi, Lake Karla and Evros Delta) where incidences of disease outbreaks in waterbirds have taken place in the past, gave presentations about the events, the actions undertaken, as well the lessons learned. 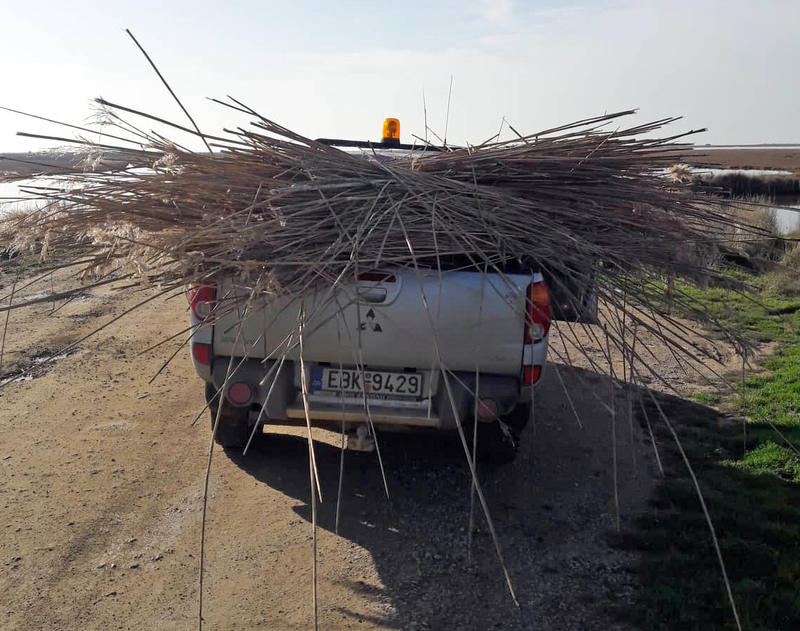 EVROS DELTA - Staff at the Evros Delta have recently put reeds on the Birdwing platform in Drana to encourage Dalmatian Pelicans to begin breeding. Although they have not bred there in recent years, pelicans were seen on the nesting platform at the end of January. TOURS - Greenwings Wildlife Holidays (www.greenwings.co) will be running various tours to Greece and thereby donating to Birdwing and other conservation organisations. FREE CHILDREN'S ACTIVITY PACK - Have you a pack of the Birdwing playing cards? 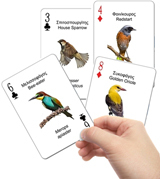 Download our free pack with activities for children at: www.birdwing.eu/files/Activity_pack_for_the_playing_cards.pdf Use it with the playing cards to help your children learn more about the names, characteristics and features of birds. The pdf can be downloaded printed and includes puzzles, colouring activities and even a maths quiz. Also, together with the bird song sound files (here), a listening challenge is also included! If you don’t have the playing cards – buy them here! THANKS - Thanks to those who have made financial donations recently and to the many who have supported us in other ways. We would also like to thank the management bodies of the National Parks for their collaboration in undertaking projects to help birds, including monitoring, maintaining and constructing rafts, platforms and nest-boxes. Thanks particularly to Theodoros Naziridis and the staff from Lake Kerkini and to Eleni Makrigianni and the staff from the Evros Delta. Thanks also to those who have contributed to this newsletter including Alex Wirth, Irene Koutseri, Julia Henderson, Nikos Gallios and Theodoros Naziridis. If you would like to donate to help our work please go to www.birdwing.eu/howtodonate or use the donate button at the top right of this page. If you have any queries contact us at info@birdwing.eu or go to www.birdwing.eu.